South Korean special envoys to Pyongyang returned with a list of agreements, but their significance will need time to become clear. On Thursday, Seoul’s National Security Office chief Chung Eui-yong briefed the nation on the results of his trip to Pyongyang, listing four major agreements. The items include the dates of the third summit between President Moon Jae-in and North Korean leader Kim Jong-un -- from Sept. 18 to 20 in Pyongyang -- and Kim’s promise to continue working with Seoul and Washington on denuclearization. The two sides also agreed to continue to reduce military tensions, and to open a liaison office in the North Korean city of Kaesong before the inter-Korean summit. Chung also revealed that Kim agrees with Seoul’s goal of declaring an end to the Korean War within the year, considering it a vital first step toward permanent peace on the peninsula. Kim even reportedly offered reassurance to the South Korean envoy that the declaration would not entail the withdrawal of the 28,500 US troops stationed in South Korea -- a major concern for policymakers in Washington. “The declaration of the end (of the Korean War) has nothing to do with weakening the South Korea-US alliance and withdrawal of US forces in South Korea,” Kim was quoted as saying by Chung, who returned to Seoul on Wednesday. But analysts have said Kim’s words of reassurance, as conveyed through the South Korean envoy, would not be enough to persuade Washington -- particularly its national security establishment -- to move away from its reluctance. Washington has insisted that North Korea first hand over a full inventory of its nuclear program before such a declaration. North Korea contends the US should sign the declaration first, as it has already taken serious steps toward denuclearization. “Washington’s resistance toward the end-of-the-war declaration is not as strong as before. Some even believe they could make such concessions,” said Ko Myung-hyun, a researcher at the Asan Institute for Policy Studies, who recently met with US security officials and experts. Experts also suggested that declaring an end to the Korean War would deprive the US of a major source of leverage against North Korea during the denuclearization process. Critics in Washington already insist that President Trump has made too many concessions -- for example, suspending major military drills with the South. Trump is therefore left with one option -- a peace declaration -- as the only way to press North Korea to denuclearize. Other measures, such as sanctions relief, would require congressional approval in the US. “I think there is little leverage left for Trump to strike a deal with North Korea using his own presidential authority,” said Park Won-gon, an international relations professor at Handong Global University. As for the summit, Cheong Wa Dae is hopeful the meeting will break the denuclearization impasse. “When the president visits Pyongyang, more in-depth discussions on more concrete ways for the two Koreas to cooperate on the progress of denuclearization are expected,” Chung said at Thursday’s briefing. Conservative experts, however, have urged caution. “The US’ position is that inter-Korean relations shouldn’t outpace (denuclearization) when the North has yet to provide anything concrete on dismantling its nuclear program. 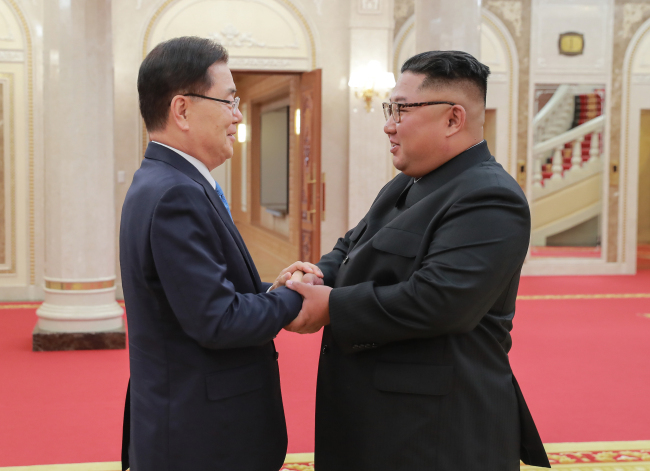 But our government seems to be pushing for improving inter-Korean relations even if denuclearization comes after,” said Konyang University professor emeritus Kim Tae-woo, former head of the Korea Institute for National Unification. Pointing to recent events such as the UN Command’s not allowing the two Koreas to conduct a joint inspection of a rail network, Kim said the upcoming inter-Korean summit could affect South Korea-US relations. The issue of the Kaesong liaison office falls along similar lines, experts say. “The opening of the liaison office depends on the mood of the US-North Korea cooperation, so they (the South Korean government) would need to check the details in line with the sanctions against Pyongyang,” Shin Beom-chul, a senior researcher at the Asan Institute for Policy Studies, said. Shin also said the North Korean leader’s reiteration of his earlier denuclearization commitment should not be allowed to overshadow the lack of tangible progress. “The trip has failed to draw fresh ‘added value’ which could move forward the stalled denuclearization talks between the US and North Korea,” Shin said. The North, however, says that its dismantling of the Punggye-ri underground nuclear test site and a missile engine facility are practical measures, and now the US should take corresponding steps. “North Korea is asking the US to take the necessary steps first if it wants to see progress in the talks,” Kim Joon-hyung, an international studies professor at Handong Global University said, adding that it would have been difficult for Chung to propose that North declare its full nuclear program as denuclearization is mainly an issue between Washington and Pyongyang.